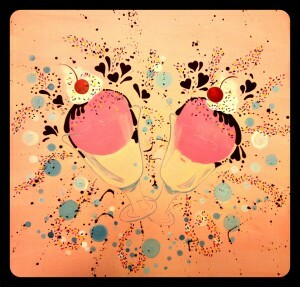 Today I finished Lauren’s Sweet sweet sundae themed heart breast painting. It has been a long time coming, and I appreciate her patience! I was very excited back in October when she did the print and became a Breastie. She attended a small Breasties party hosted by a mutual friend of ours. Not only did she produce her first Breasties print, she also received the highest score on the Breast Test, and still remains the highest scorer to date! Lauren knew what theme she wanted going in, and after a little brainstorming we were both excited about the vision we had. Lauren had viewed the Breasties gallery prior to the party and took a liking to my personal heart breast painting themed, Sweet Tooth. Both Lauren and I have a sweet tooth in common. She enjoyed the playful take I portrayed on my canvas, that painted a fun and colorful theme of my favorite strawberry ice cream flavor. Lauren liked the combination of colors on my heart breast painting, mixing in pinks and light blue to give it that classic ice cream parlor feel. There is just something about the right hue of blue that says old fashioned ice cream parlor. Lauren and I both agreed that her Sweet Sweet Sundae theme should contain this classic color as well. She decided that her print would be the ice cream scoop on top of the sundae so she picked a light pink color to represent strawberry ice cream. To compliment the strawberry ice cream we decided bright colored sprinkles and whipped cream on top would accomplish exactly what we had envisioned. I added the chocolate heart shaped splatters, because what is a sundae without hot fudge!? After applying the sprinkles and whipped cream I decided what better to finish off the painting than a cherry on top! Not only do I feel I accomplished Lauren’s vision, but I truly believe it represents Lauren successfully. She is a sweet, cute and colorful individual and together we made a difference! To learn more on how you can become a Breastie, click the contact tab and shoot me a message! Also to view all the Heart Breast paintings check out the gallery page. Peace, Love & Sweet Sweet Sundae!